The Bureau of Engraving and Printing (BEP), the government agency responsible for printing US currency, has released the newest addition to the Presidential Portrait Collection, the President Barack Obama Engraved Portrait. The collection features portraits of each US President captured with the "artistry and craftsmanship of skilled Bureau of Engraving and Printing employees." There are two hand engraved pints available, a large 9" x 12" Obama portrait for $5.50 and a smaller 6" x 8" for portrait $5.00. 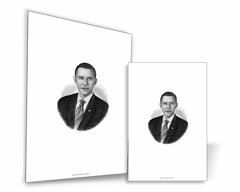 The complete Presidential Portraits set is on sale for $134.95. Orders may be placed through a downloadable and faxable form on the BEP’s website located here. Customers may also call the BEP directly between 7:30 AM – 7:15 PM (ET) at 1-800-456-3408.